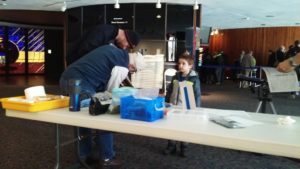 This note is a follow-up to the many questions I received at the Feb ASRAS meeting Friday night on how the radio telescope project (Solar Spectrometer) is going and the other projects I’m involved with at RIT. 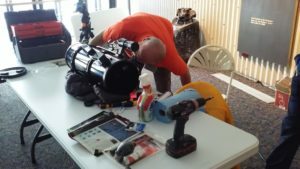 As most ASRAS members know, I retired from the board so as to be able to concentrate on bringing the Solar Telescope project to fruition in Ionia. This RT project has been making its way through the different development phases while at RIT in a program called Multidisciplinary Senior Design (MSD). It is a process driven class, where seniors of different majors (ME, EE, CS, etc.) work on projects in a team environment. Just like real life in Industry. I’ve been both the customer for their efforts and mentor for two years. Little did I realize at the time, I would be asked to rejoin RIT (3rd time around) as a mentor for other projects given my background, and the fact there’s been a spike in enrollment of this class (up 30%). A radio astronomy project to study the RF signature of Sunspots. An upgrade to the original prototype RT dish for ALMA (Chile) on Kitt Peak owned by the U of Arizona to convert it to an imaging RT spectrometer running at 200 – 300 GHz. Project to develop a hybrid rocket motor (for a yet to be designed rocket) to go to 30K ft for a nationwide college IREC competition to be held in New Mexico in 2019. Connie Jones from the U of R Physics and Astronomy office would like to announce the Elliott Montroll lectures with Prof David Stevenson from Cal Tech. Hans Heyn was born in 1938 in the Netherlands. He went to Delft University for a BSc and MSc in Chemical Engineering. He joined Esso, now ExxonMobil in 1960 still in the Netherlands. He moved to Exxon Chemicals in Brussels, Belgium in 1967 and then on to Productos Quimicos Esso in Castellon, Spain in 1971. In 1975 he moved from Spain to Canada where he became involved in hydrocarbon based plastics. He subsequently moved for Exxon Chemical to South Carolina where he became a US citizen and finally to Illinois. Most of the time he was involved in R&D. He retired in 1998. Hans is a long time radio enthusiast and has the amateur radio call sign KB9MFQ. You did not hear much about ASRAS’ Jove project during the last year or so, because not much happened. But that is going to change, and the 2017 – 2018 plans are ambitious. Jove is a radio astronomy project, and that label may have led to some misunderstanding of what this is all about. Some astronomers think that optical and radio astronomy are different disciplines. But that is not so. Both study the electromagnetic waves emitted (or reflected) by astronomical objects. The only difference is the observation wavelength, just as the differences in wavelength between optical astronomical observations in the Infra-Red, Visible or Ultra Violet parts of the spectrum. Optical astronomy involves wavelengths measured in angstroms, while in radio astronomy the wavelengths range from fractional inches to tenths of feet. That is roughly a billion times longer. To build a radio telescope analogous to an optical telescope would thus require a much larger aperture. That is not really practical; even the Arecibo radio telescope in Puerto Rico (1000 feet diameter) and the new one in China (over 5 football fields in diameter) does not come close. Because the wavelengths are so large, radio telescopes often do not produce images. Instead the radio receiver is tuned to a specific wavelength and the strength of that emission is measured over time. However large radio telescopes or several together can produce images by aiming at successive points around the object of interest. You can’t call Meade Instruments or Edmund Scientific and buy a radio telescope. You have to build it yourself. Early radio telescopes were like Galileo’s first refractor, and are fairly easy to build. But there are many more reflector telescopes, often reusing obsolete radar hardware, or custom build, sometimes at very high cost like Arecibo. Most amateur radio telescopes are more modest however. In radio telescopes, the antenna is the body of the telescope (gathering the signal) and the radio receiver is the eyepiece. 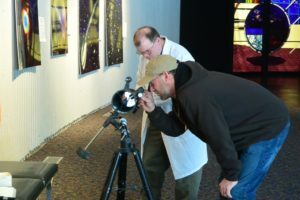 In optical astronomy you look through the eyepiece at the image of the astronomical object or make photos. And looking at such an image today is often via a computer screen connected to a video camera, replacing the eyepiece. In radio astronomy there is often no image to look at. Instead there is an electrical signal that we can see and analyze on a computer screen and evaluate over time. And in some cases that signal can be send to a loudspeaker and can be heard. Jove is a NASA project that started some 20 years ago. It involves a very simple refractor type radio telescope, using a 23 feet long antenna and a radio tuned to 20.1 MHz, the frequency that corresponds to the wavelength NASA found most useful to study Jupiter. As in a Broad Cast radio, the Jupiter signal is demodulated and produces sound. Jupiter sounds like crashing waves or distant thunder storms. This signal is processed by a computer and send to the NASA Jove net for further study. There are several hundred Jove telescopes all over the world, collecting Jupiter signals, but from different locations, building up the Jupiter data base and contributing to the understanding of that planet. ASRAS’ Jove project to date has one NASA 20.1 MHz radio, the parts to build a second one, and the hardware, wires and such, to build one antenna. The plan is to install the first radio in the Ionia library, where it can be connected to the internet, and to attach the first antenna to the South facing facade of the main building. This combination is targeted to be operational before August 21, in order to be able to determine the effects (if any) of the solar eclipse on the measurement of Jupiter radio emissions. Next in 2017 will be the completion of radio # 2, as spare for # 1 and completion of a reliable internet connection with the NASA Jove network. In 2018 the first antenna should be replaced, increasing the gathering power of ASRAS’ radio telescope. Also in 2018, a spectroscopy capability could be added, maybe scanning from 18 to 22 MHz, NASA is still studying that. It is possible to reach the August goal with one ASRAS member and a summer student from RIT or the U of R. But only just, and it would not be a real ASRAS endeavor. 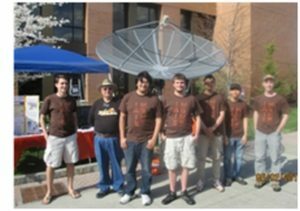 What is really needed is a team, of say five ASRAS members, with different backgrounds (computers, amateur radio, and software) to tackle the different parts of the project: antenna, radio, physical installation and hook up, computer processing of the data and sending the data to the Jove net. That team would next decide if and how to improve the radio telescope’s gathering power, if and how to add spectroscopy eg. by electronics or entirely by software, and draw plans for a further future. This team could also assist with the imminent move of the solar telescope and spectrometer (eCallisto) to Ionia. And forming a radio astronomy team at ASRAS will insure continuation of this radio astronomy capability in ASRAS. We had great success at our first Annual Telescope Tune Up day yesterday ! We had about 18 people bring in telescopes for cleaning, alignment, and instruction ! Thanks to our hardworking volunteers ! Thanks to Steve Fentress and Strasenburgh for allowing us to set up in the lobby. All of our customers were very happy and excited we were able to help them. Ionia Fall Festival – Sat Sep 17 ! ASRAS Membership meeting – Friday Sep 9 @ RIT – NOTE LOCATION CHANGE ! ASRAS Membership meeting – Friday Sep 9 at RIT ! Please note the location change ! Dave Bishop has some RIT students lined up to give a special talk and we need to move to RIT for this meeting. Welcome to the new ASRAS website ! Welcome to the new site everybody ! Please be patient while we put the finishing touches on our new wordpress website. We do NOT have member log-ins yet. It will take a while to figure out what to make private and public. See something broken ? Feature missing that the original had ? Please let webmaster Joel Schmid know. 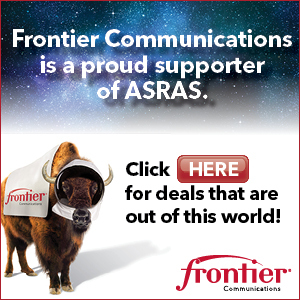 We are looking for ASRAS web-site contributors ! 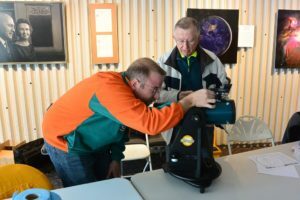 Please let – you guessed it – webmaster Joel Schmid know if you would like to learn how to put cool astro-stuff on the website !